What started out as a simple car wreck at the beginning of the night, ended up as a car with no windows, doors, roof or B pillars. Extrication Night or how do you remove an injured person from a damaged car. I called it, Wow, this is a lot of fun chopping a car into pieces. 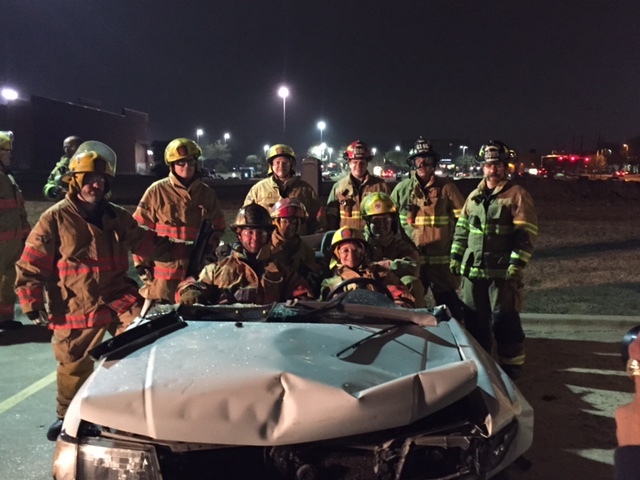 What is interesting is Vehicle extrication is not about removing an injured person from a damaged car. It is about removing a vehicle from around an injured person. 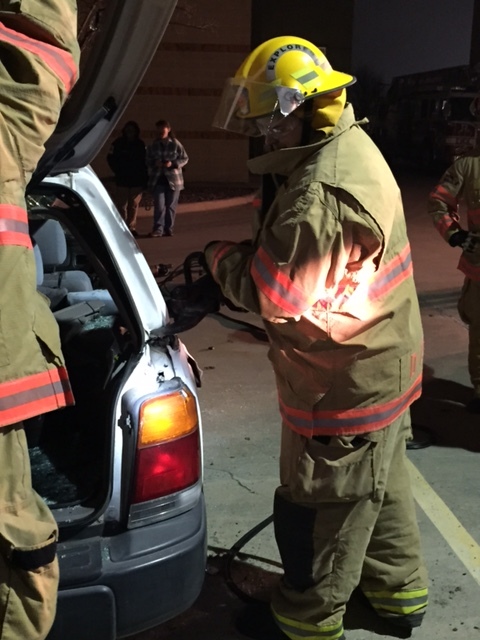 The purpose is to remove parts of the vehicle that impeded the safe removal of a person. 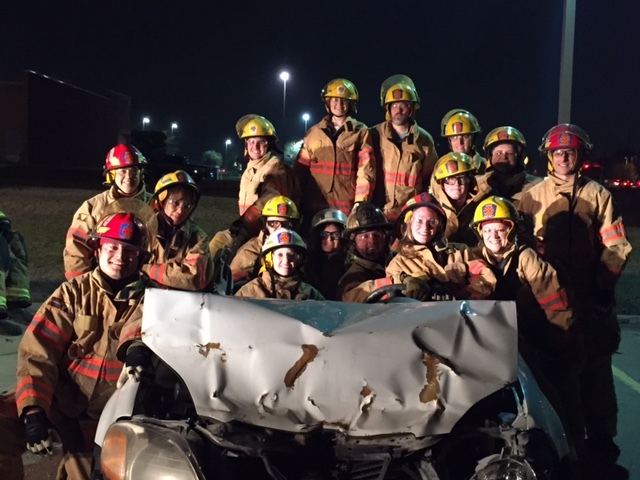 Our firefighter instructor explained, if we can not remove a person from a car easily, then the car will be totaled. We do not worry about the state of the car when completed. The focus is the injured person. The first step when approaching the car is to stabilize the car. As explained to us, “It is very embarrassing to have the car you are working on start rolling away.” Chock blocks were placed under the four corners of the car and the air was removed from the tires. This allowed the car to settle down on the blocks. The tool to deflate the tires is basically a pick. Take a swing at a tire and you hear the sudden whoosh of air. The car settles on the blocks and is stable. The next step was the removal of glass. We used two different methods. The first was an axe to the window. It takes a lot of strength to break a side window with an axe. The other option is using the window punch tool to break the window. The window punch was amazing. A slight pressure in the lower right corner, shatters the window. You then can fold the glass in and remove it as one piece. The glass is contained and easy to clean up. This is an older car window. New cars have a plastic sheet embedded in the glass that holds all the glass together. Once all the side windows were removed, we used a window saw on the front windshield. We used a hand saw, but the fireman will use a battery powered saws-all to remove the windshield. It was now time to remove the doors. 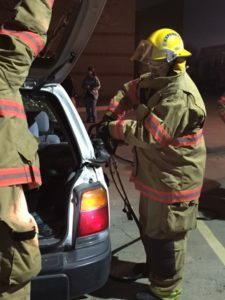 We used a combination of the jaws of life and a cutter. Both tools were ran by hydraulic pressure. You use the jaws of life to pull the doors away from the car to get the cutter into the hinges. It takes about 2 minutes to remove a car door. Once the doors are removed, you then cut all the pillars holding up the roof. Once the pillars have been removed, you are able to pick it up and remove it. The video below walks you through all the steps. The biggest challenge is airbags. Airbags are explosive and all the molding within the car had to be removed. This allowed us to validate all the airbags were removed or allowed us to cut around the airbags. We started the night with a nice clean Subaru wagon and ended up with a Subaru convertible wagon. It was a fun night.